The triceps fascia, when it shrinks, sticks to itself in knots and is otherwise unhealthy can cause all kinds of problems – from middle or mid back pain, upper back pain, neck pain, shoulder pain to golfer’s elbow etc. Personally, I’ve benefitted tremendously from releasing my triceps because I’ve had on and off middle back pain for years due to looking down all day. Every time this area is released, even if I don’t have pain, I feel tremendous and immediate upper body freedom from my back all the way to the top of my head and shoulders. I use the Kinetix version of this technique (where I’m stepping on someone’s triceps) to relieve all of the above mentioned issues. Of course I’m always looking for the root cause of pain, and we’re “mapping” the client’s fascial system left and right from the forearms all the way up into the traps, rhomboids, lats and scalenes. Click here if you have middle back pain, and use this release in combination with my other techniques for this! If you have rotator cuff issues, then I’d definitely pay some attention to your chest, biceps and rear deltoid. Golfer’s elbow could indicate you also need to release your forearm fascia, and maybe your brachialis too. For neck pain, make sure to try my SCM and scalene release by clicking here. Find the adhesions, and when you find one – go back and forth slowly for 30 seconds to “shear” those fascial fibers. 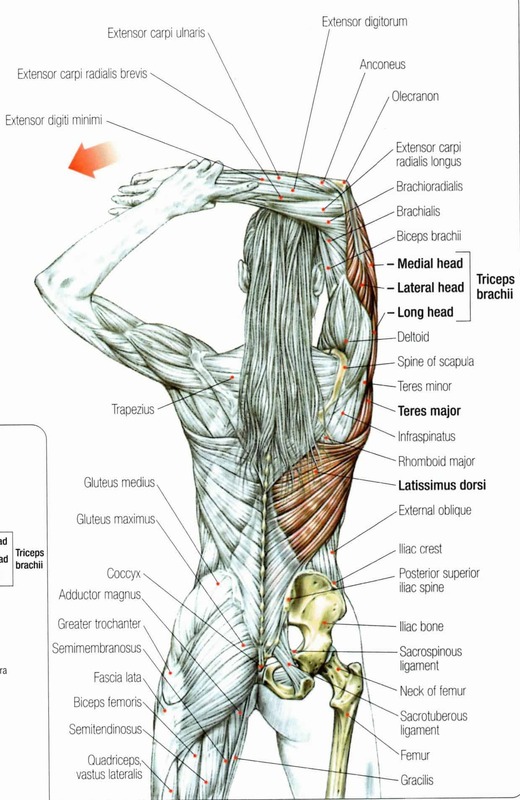 Find 3-4 spots in your triceps, from close to the elbow all the way towards the armpit. DON’T just roll on the roller or massage yourself here. The goal is always to PIN tissue between your bone (in this case your humerus) and the tool (in your case, a foam roller). The compression between these two combined with your slow deliberate movements is what will release this fascia fast, giving you a rapid result. Watch the full demo in the video, then comment on YouTube telling me you’re going to DO IT. Information is useless unless it’s used right? Then I’d love for you to come back here and tell me how you feel AFTER. Pain doesn’t have to be scary when you know why it’s happening. Keep in mind, there may be additional areas that you need to release or strengthen to get complete resolution but I promise – pain happens for a reason, and your body just needs your help! There’s always a solution. As always, I hope you’re learning to trust your body so you can adventure through life with confidence! You’re so welcome! I’m glad it’s helping! Thank you so much for taking the time to do this for those of us that need it. I am watching all of your videos and trying all of these techniques. Thank you so much. I injured my rotator cuff a couple of years ago and it still gives me problems. I’m also 58 so those aches and pains are starting to appear. I can’t believe how much doing simple techniques like this have helped. Thank God I didn’t opt for the surgery! I’m so thankful I found this!! I was recently diagnosed with impingement syndrome and golfers elbow, but I have distinct pain in my tricep. Going to try this now!! Thank you!! Thank you – I like this. If I could make a suggestion Elisha. The best golf instructions are overplayed with guiding lines and arrows. This video would be enhanced with an arrow indicating where you are pinning your fascia. Plus a couple more arrows indication the direction of movement of your hands/arms. Another arrow could be used to illustrate how extra force could be used through say your body or shoulders. I swim lots and I did not know I had tight fascia until I tried this. My right arm feels much softer and it feels lighter when I swim. Thank you so much for this! I do this one and my forearms off a chair back or a table whenever I think about it. Or with a ball against the wall to some extent when working upper body. After at least a year, I keep coming back to these videos to get inspired. Before I started watching Mobility Mastery videos, my many problems, including low back, piriformis, golfer’s elbow, TOS, pinched nerve and others were starting to make me more inactive. I started seeing things as a puzzle to solve and tried to figure out what my body was telling me, and to keep up hope through all of this. I couldn’t afford all the chiropractic and bodywork I needed, so I was feeling down as my possibilities became more limited. After trying these techniques and after trying a different point of view about my problems, I got psyched to see problems gradually slip away. Maybe not all of them, but it is great to play piano, be able to sit on the floor and play with the kids or animals, get more physically active again, get on with my life, and Elisha Celeste’s work has made that possible. I don’t take things for granted anymore, it’s little things like that I can be thankful for.